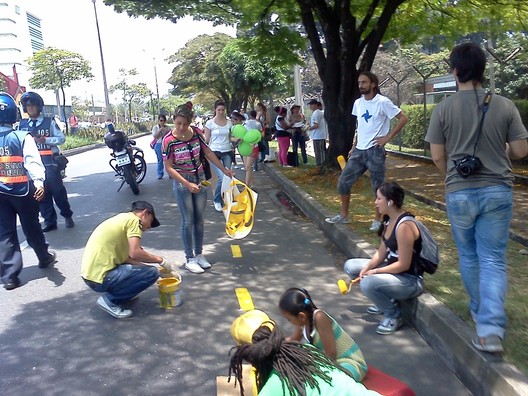 In past posts I discussed Guerrilla Gardening and Urban Knitting as forms of Urban Informal Expressions. In this post I present another form that I recently discovered: Guerrilla Bikelanes. The video below presents a Guerrilla Bikelane group in action in NYC. As in the case of Guerrilla Gardening, Guerrilla Bikelanes are generally the product of organized citizens who want to take over space (streets) for a specific purpose (building their own bike networks). 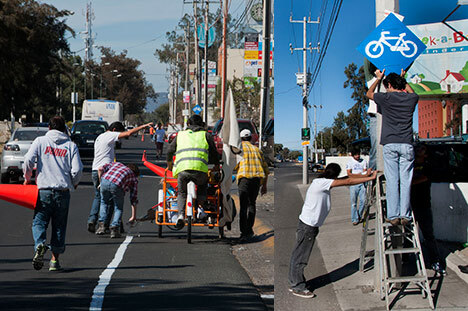 From my knowledge, the Guerrilla Bikelanes movement started in North America and Latin America and has spread in recent years. A little research showed that this type of movement has been active in countries like Mexico (Mexico DF, Guadalajara), Colombia (Medellin) and the United States (NY, L.A and Seattle). What is also interesting is that in some cities, local administrations have responded possitively and adopted into the road network the informally created bikelanes. Being a bike-adict I am more than supportive of this type of movement. What do you think? As usual, you can see more pictures and find some links below.